Licensed to Ninja tune for Europe. This is the story of three kids that were captured in the mid 80`s by a musical style that was long gone, in fact, never really happened in their home town of Munich/Germany. It was the explosive dynamics and the rough sounds of numerous late 60`s and early 70`s independent funk bands that sublimed their whole musical approach towards a even more defined stylistic expression. After early excursions through the universe of rare groove 45`s (collecting records and discerning the deeper contents of this music), they started to create their own small renaissance of this special style by founding their 7" label "Hotpie & Candy Records" to release first creative moments (yeah!). Using specific equipment and recording techniques they developed a trademark sound that laid a foundation for a unique output that goes far beyond your average "Soul Brother No.1" style funk. Growing local success led to the release of a now "classic" debut album (Practice What You Preach, 1993) and supported their urban guerrilla tactics to react against cheesy and overproduced mainstream entertainment (especially the then successful "Acid fake-Jazz" hype). Following this LP, further 7" releases were issued on their own label (introducing different side-acts such as "The Pan-Atlantics", "Bus People Express", "The Soul-Saints Orch. ", "Bo Baral´s Excursionists Of Enlightenment", "The Woo Woo´s" plus many others). In the later 90´s they planned to record a second album before concentrating on other projects. "I first discovered the Poets of Rhythm on a record buying trip to New Orleans in the early nineties. It was one of their anonymous releases on their Hotpie & Candy label, and included in the sleeve was a photo of the guys in front of Sea-Saint studios, the famous studio owned by Meters producer Allen Toussaint. I was totally confused by the photo, and figured it must have been planted in the sleeve by some record collector practicing a random act of silliness. I was totally convinced this was a 45 from the early 70's based on the title, the way it was mixed, the instrumentation, and the arrangements. When I asked around to my collector friends, nobody seemed to have heard of the group, but some did have other singles on the label. 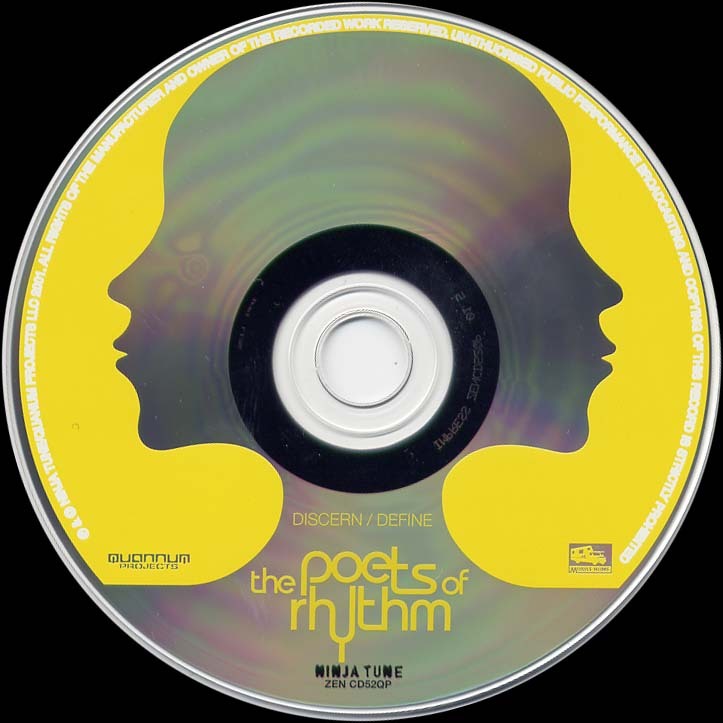 "About a year later, the only cool record store in Davis had an album by the Poets of Rhythm, and after seeing them on the cover, I instantly made the connection. What set them apart was their total commitment to authenticity with regard to that special era of funk they embodied so well". "With the release of the Latyrx album on Solesides," Lyrics Born remembers, "I was in constant contact with a SoleSides enthusiast who championed our album within our then German distributor. I had done a song called "Burnt Pride" that had a very live feel, and wanted to further pursue making more live music, and asked if he knew of this group in Germany that I knew could interpret my ideas. The group I asked him about was the Poets of Rhythm. As soon as he told me he was on of their producers we began trading tapes and stories, and the relationship was established. Perhaps because of this new impetus, or because Poets of Rhythm were just meant to be, the band re-formed. "Later in '98 I flew to Germany and we began working on what would become my solo debut "Later that Day." While in the studio, the guys played me what would become "Discern/Define." Listening to the tracks I was blown away by the way they had grown so much since the Hotpie and Candy/Practice What You Preach days. Gone were the "funky" song titles and James Brown-ish grunts. What replaced them were incredibly intricate arrangements and rhythms, each instrument cleverly placed to fill in the gaps within the bar, creating an exhilarating "push-pull" effect. The musicianship was now world-class and tighter than most bands I have heard in our time period, regardless of genre. It sounded so good, I had to borrow the backing track for what would later become our club hit, "I Changed My Mind"
"What sets the Poets apart from other bands in this newly emerging modern funk movement is that they have an undeniably distinctive voice. Nowhere on "Discern/Define" will the listener find a cover version of a funk standard. The Poets have created new standards, transcending the current parameters which they are assumed to reside within. Their sound is fine tuned yet wildly eclectic, citing african rhythms, gritty rock riffs, psychadelic sounds and soulful melodies, all backed by that omnipresent funk backbeat. Their message is often spiritual and inspirational, yet most importantly, relevant to the present, with song titles like "Guiding Resolution", "We (as a Part)", and "Smiling while you're Crying". They have that unique power of being able to depart from tradition in order to bring advancement to the music and entice unsuspecting listeners, yet still please the purists with home-cooked "Funk of Ages" values, as I like to call it. Songs like "The Ham Gallery", and "The Jaunt" show they can still rock a party better than ever, all with a sense of humor and a dash of off-the-cuff panache. Their music has catapulted them into the next era, raising the bar for up and coming groups within the newly emerging modern funk movement, and the Poets of Rhythm are unanimously regarded by those same peers as the standard bearers. Why? One listen and you'll see why it ain't hard to tell."